Is there a Bible-believer who hasn't asked that question? Yes, I'm sure there are many, perhaps even most. Because most people who believe in the Bible have never read it (all of it, that is, not just carefully selected bits and pieces). But what about believers who have read it? Have they asked themselves that question? 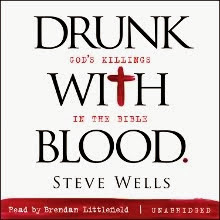 I suspect that most have, since they believe that Bible is the pure word of God, and yet when they read it (the whole damned thing), they find that it's about as pure and inspired as the rantings of their drunk uncle at last year's Christmas party. Take Karl Giberson, for example. He is a Sophisticated Theologian (a term "Coyned" by Jerry Coyne) who is ashamed and disgusted by the Bible, while he pretends to believe it is the inspired word of God. Here are a few quotes from his recent HuffPo article, "If only we could edit the Bible." I have often wondered--quietly and usually to myself--what would happen if we could edit the Bible. Wouldn't it be good if some ecumenical committee could go through the Old Testament and take out all the language about stoning people to death for breaking various rules? Or maybe soften that passage where the Psalmist talks about bashing the heads of the babies of his enemies against the rocks? We could also fix some of those New Testament misquotes of the Old Testament. He doesn't, of course, follow through with his suggestion. He leaves all the nasty stuff in the Bible alone and continues to ignore it (while pretending to believe it). That's sophisticated theology for you. So I thought I'd give it a go and help believers relieve themselves of the embarrassing parts of the Bible. Exodus 21.20-21 “If a man smite his servant, or his maid, with a rod, and ... if he continue a day or two, he shall not be punished: for he is his money. Ezekiel 23.20 "For she doted upon their paramours, whose flesh is as the flesh of asses, and whose issue is like the issue of horses." This is just a start, of course. I have thousands more to suggest. If you're a Bible-believer, let me know what you think? Are there any verses on my list that you are proud of? If so let me know. “He that loveth father or mother more than me is not worthy of me: and he that loveth son or daughter more than me is not worthy of me.” My family definately agree with this. Sarah, I think your family may be seriously messed up.